But not everyone saw that unfortunate potential: lots of you actually saw a crisply tailored dress in a playful take on two elegantly subdued colours. 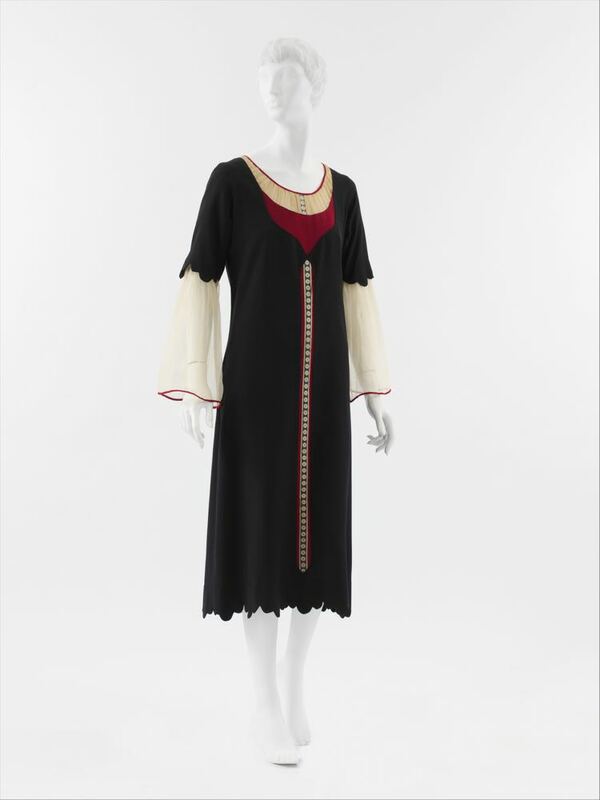 This week’s pick is a 1920s frock by Poiret, which balances the new move towards streamlined and simple with his trademark eye for details and sense of humour and whimsy. And the whole dress has a trompe l’oeil layered effect, with a ribbon printed to look like buttons winding in and out of the layers, teasing at the idea of an entry point, and confusing the eye as to which layer sits above which other. What do you think? 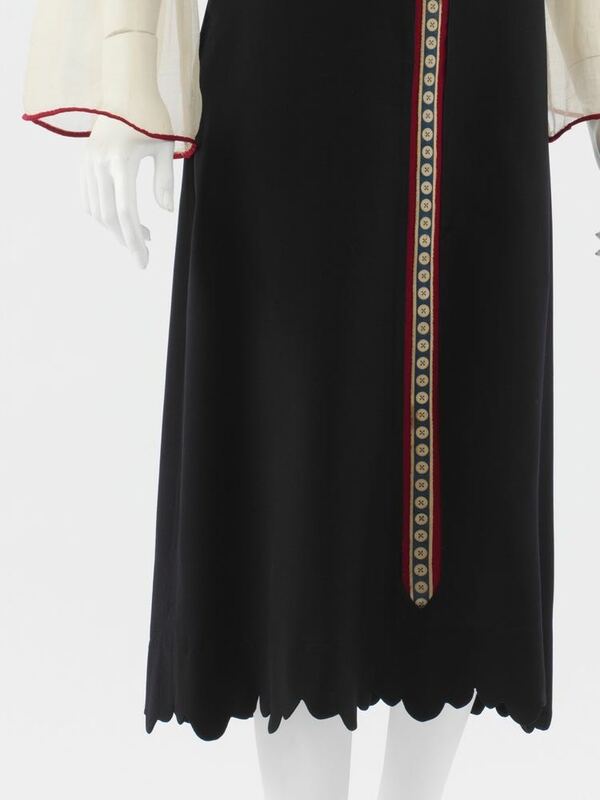 Has Poiret successfully blended sophistication and humour? Overall I like it. the front and sleeves lend it an almost ecclesiastical style, and the colors contrast harmoniously. Do no care for the bow at the back, through. It just doesn’t seem to match the look of the front. 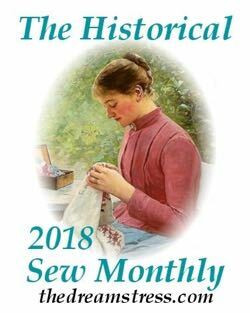 Perhaps it’s because the bow is soft, while the front is crisp in appearance (and the sleeves, though in a soft fabric and drape, are defined by the red binding. Ooo! I love practically everything about this dress, except maybe the lower half of the sleeves (they weird me out a bit, although I imagine they would look better on an actual human). The false-button/ribbon is delightful, and the bow on the back is nice. I love the trickery with the layers on the front! I would definitely wear this. Definitely. I love this one. 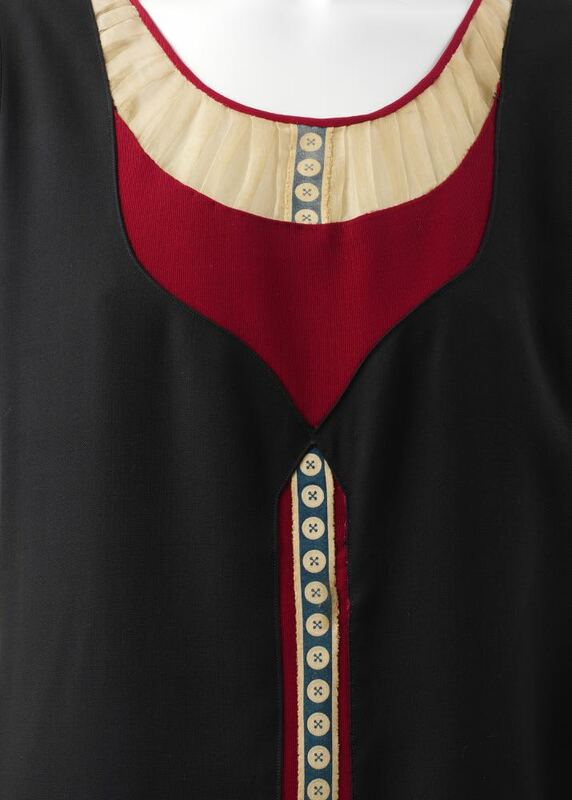 Faux buttons and scalloped hems, flame red enlivening the black and white. I had no idea anyone had made such a fun formal dress in the 20’s. Died and gone to heaven! 10 out of 10. So clever, so sleek, such excellent colours! The clever over-layer, under-layer button thing! The simple-yet-not sleeves. And I really turned into a little quivering wreck when I got to the hem! How couture is that? That represents human effort – hours and hours! I like the colors, and the sleeves. 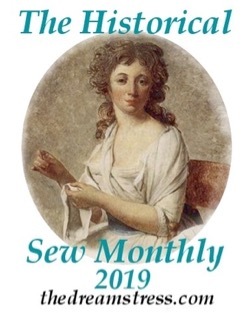 The trompe l’oeil bothers me because, in close up, it’s possible to see that the faux button placket has ragged edges, which colors my view of the worksmanship of the garment. Bottom line is that I rather like the garment in the abstract, but think that most women–including me–would look dowdy and unattractive in it. So between the faux placket and the dowdiness, 8 out of 10. If you bobbed you hair for the first time ever, you would celebrate the occassion with this dress, and its cheery back bow. The faux buttons are lovely. 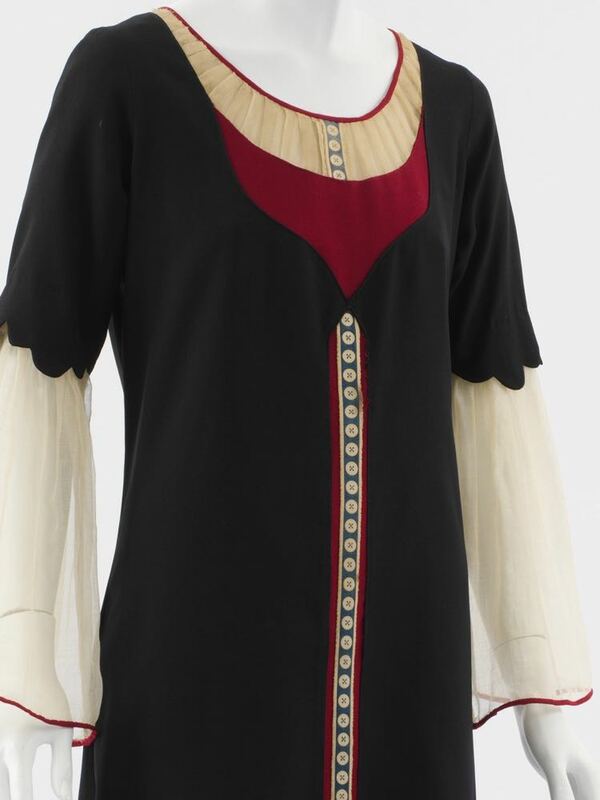 The suggestion of a plunging neckline with the inset of red is even more charming. I wasn’t sure, at first, about the sheer sleeves, but the red piping won me over. The scallops underscore that this is not an ordinary dress, or design. The color scheme is timeless. I hope that there were shoes with faux buttons, too. Whimsy indeed! Yes it does blend sophistication with humour rather well I think. I’m not a fan of black clothing generally, nor do I like scallops and bows but somehow this works for me. I like the white chiffon lower sleeves. It would have been interesting to add the chiffon below the hem too. 8 out of 10 from me thank you. Poiret is my favorite designer. He invented modern western clothing, this is a nice example. 10. A lovely kickstart of the Halloween rush here – it has a slight witchy vibe that really does it for me. 10/10! I like it. Not sure about the dagged hem and the chiffon sleeves ( ilike the idea of the sleeves but not sure if it really works here, maybe if it was black chiffon instead)), but love the colours, the overall idea, the red trim at the bottom of the sleeves, and the defiant bow on the back. Would have preferred maybe a red trim on the hems (like the sleeves) but maybe that would have chopped the line off horizontally too much. This would have been a very comfortable dress to wear, and yet still one in which you could say, “I feel pretty”. Bring on the cherry-red lippy! 7.5/10. I really like this dress! The printed buttons and scalloped edges are tremendously cool, and the bow on the back is lovely! The only thing that gives me pause about giving it a perfect score are the second layer of sleeve. I don’t even think I dislike it- I just think I’d like it better if it stopped at the scallop on the top sleeve. I’ll be dreaming about the printed buttons and unique scallop for a while though. I love everything about this dress, apart from the lower sleeves which seem out of synch with the rest of the dress to me. … such an innocent little dress, so simple, until you start looking at the construction. Love the red and black contrast, the insouciant rear view with a fluttering bow, and the dirndl-inspired sheer gathered chemise on the bodice. 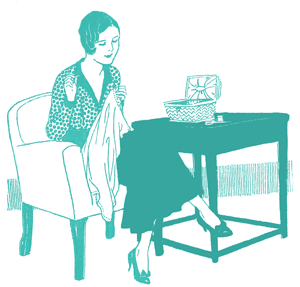 I think the sheer lower sleeve is detachable because I have seen many examples in the 1920s fashion plates. And they aren’t as yellowed as the chemise at the neck. This one hits the bullseye. I hate to say it, but I dislike almost everything about this dress except for maybe the hem. I really don’t like faux layers and the sleeves look awful to me. Without the sleeves I could maybe get behind this. But there’s also something about the harsh contrast between the black dress and the layers that looks off. I appreciate the whimsy, but overall a big fat no for me. I LOVE this and I want one NOW. Those scallops are superlative, and the button-print ribbon tickles my sense of humor. I might do the main body of the dress in navy, but I won’t say I don’t like the black. The flowy sleeves, the bow in back–it is all fun, fun, fun! It’s very fun to look at, and I admire its unconventionality. This sort of dress is made to be in a poster or a book cover of that era, set against other bold primary colors and strong shapes. But what works well for it as an art piece might be working against it as a wearable dress. This is definitely the sort of look that could easily overwhelm or distract from its wearer. My impression is that it’s interesting and attractive in some ways, and artificial and off-putting in others. The dress feels very inorganic to me, and so I have trouble imagining it on a real person. On Gloria Swanson in a poster or on a sleek bobbed girl in an illustration? That comes easily. Just a normal person in a normal setting? Harder. There, it starts to become a little clownish to me. But the more I look at it, the more it grows on me. 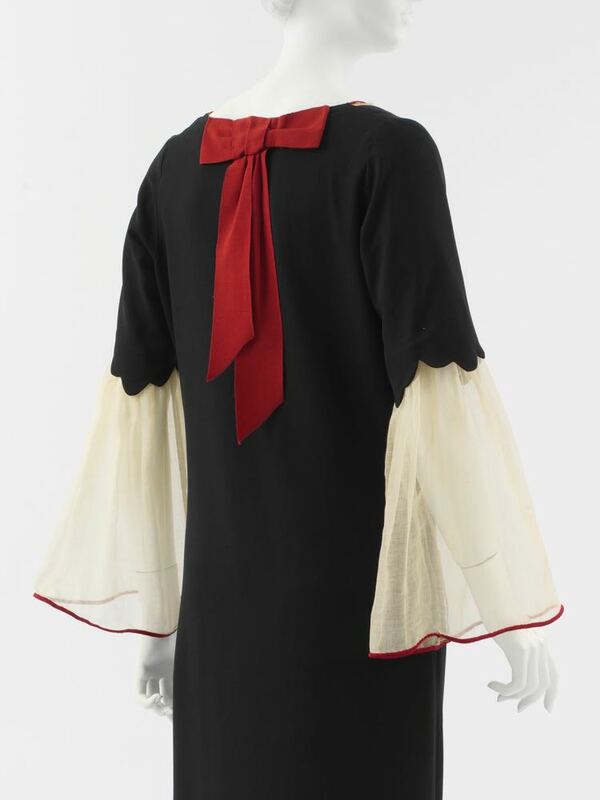 I like the shaped hem and the red bow, it really pops and you can see a start to the obsession with the backs of dresses in the late 20’s and 30’s. I don’t like the lower sleeves or the mock neckline. The button trim is sharp but just not my taste, it’s almost like it was some spare trim and just got put on because! I would love to know how the hem is done…..a facing? Binding….? So fun. Also the bow in back and the pretend layers in the front. It would be great to see it on a moving person. I have a hard time with the bow. It looks like an add-on; otherwise, it is simply perfect. I can certainly appreciate the clever details…but I can’t get over how it looks like something somebody would wear to a ren faire. I’ve always wanted to try to recreate this. 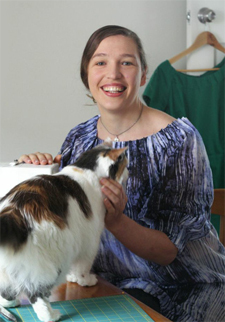 There is a Georgia O’Keeffe dress that has the same feels. I got excited at the first glimpse of this, wondering if it was going to be something a lot more medieval-esque, and then I saw the rest of it, and… Well. Here we are. It might have slightly more eye-appeal for me if it didn’t play the “Which layer are the ‘buttons’ really on?” game, but that, combined with a style era I don’t much care for anyway, does it in. The bow on the back deals it the final blow. It’s just such an odd addition that doesn’t seem to go with any other part of the design past colour. 6/10, for being somethng I could like if it had been done in a different way. I like most things about this dress. The colors the silhouette, i love th bow! And in all my years of looking at this, i never noticed the buttons were fake! But i could do without the hem, well made though it is. And i HATE the sleeves. The worst look fashion ever came up with is short sleeved top over a long sleeved top. And thats exactly what it looks like. Get rid of the sheer sleeve nonsense and its a gorgeous dress. Not a huge fan of trompe d’oeil, but I like this dress. The colors and whimsy are delightful, the overall silhouette is graceful, and the hem is breathtaking. Minus one point for the “button” strip not going all the way to the hem (it points out the faux nature of the buttons) and the lower sleeve treatment. I like it, and then there are “buttons”… which my koumpoujophobia would have preferred not to be there. I don’t like the chiffon sleeves or the bow at the back, I just don’t like bows on things. Otherwise I can only say it’s not what I would have worn and had I the money I would not wasted it on this. 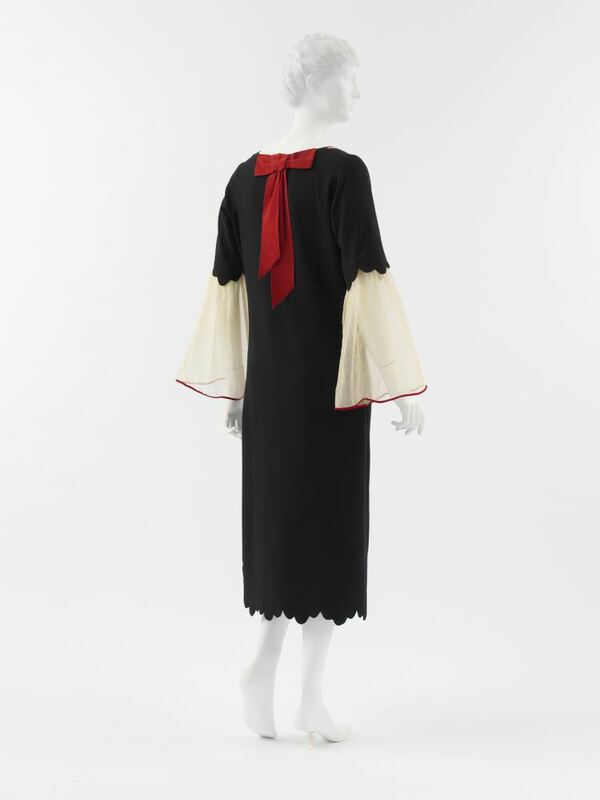 I’ve never before seen a dress by Poiret that I’ve liked so well. My first split second reaction to the rather globular and irregular nature of the scalloped hems was ‘Someone’s tipped a pot of paint over that dress!’ After I had had a chance to have a better look I liked it instantly! But for me the bow is what makes this dress as it pulls together the classy and playful components beautifully. Infact I could easily picture myself wearing this dress. Having said all that, technically and structurally it is very simple compared to some of its predecessors and since some of my mark goes on labour and execution, I find I am capped in my rating.